One of the projects of the Chemelot Institute for Science and Technology (InSciTe, the Netherlands) has been granted permission by the Dutch Health and Youth Care Inspection to enter the clinical test phase. 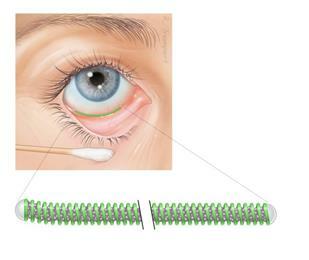 The Ocular Coil Drug Delivery Comfort Trial (OCDC) project developed an innovative way to apply medication to the eye. The OCDC is the first public/private collaborative InSciTe project to reach this crucial phase within three years. This is an important achievement for the project partners and InSciTe. The answer devised in the OCDC project is an innovative eye implant, in the form of a small flexible coil that can be placed under the eyelid. This ocular coil is coated with a special smooth coating, so it will not be felt behind the eyelid. The coil contains a drug delivery matrix made of a unique biomaterial that can deliver a drug over a period of weeks or months, depending on what is needed. This method will give patients more freedom in treatment, accurate drug administration and there are no caregivers needed," says Professor Rudy Nuijts from the Maastricht University Medical Center+ (MUMC+), who is heading the OCDC-project. "Our aim is to provide an improved alternative," continues Nuijts, Using common traditional delivery systems for diseases like glaucoma and inflammation is not very effective most of the time, due to the low amount of drug that is absorbed in the eye. Our goal is to provide a way of delivering drugs to the eye that will be more effective, with fewer side effects, and which will gain higher patient compliance." The OCDC consortium that is involved in developing this coil includes, in addition to the MUMC+, the Technical University of Eindhoven and medical device start-up Eyegle bv. With this clinical study, the comfort of the placebo-filled coils will be tested in healthy subjects. "The goal of the biomedical program of InSciTe is to accelerate the further development of the proven concept towards clinic and market. InSciTe promises this with their unique Matrix concept that offers a complete learning- and working environment, with a Quality Management System, Infrastructure, Equipment, Training and Professionals. A full-service package where clients, whether these are public-private projects or start-ups, receive guidance in setting up their own Quality System and learn how to collect supportive documentation. In addition, they are taught how to produce their product according to the required regulations, in regard to infrastructure (cleanrooms) and equipment (validated and monitored)," says Danielle Curfs, Biomedical manager of Chemelot InSciTe. "When everything goes to plan, the OCDC-consortium will have the first results of the comfort trial and the effectiveness studies with the sterilized placebo filled coils by the beginning of 2019," says Danielle Curfs. "This is a major step for InSciTe to validate the matrix-concept that promises to bring new innovations faster to the market."